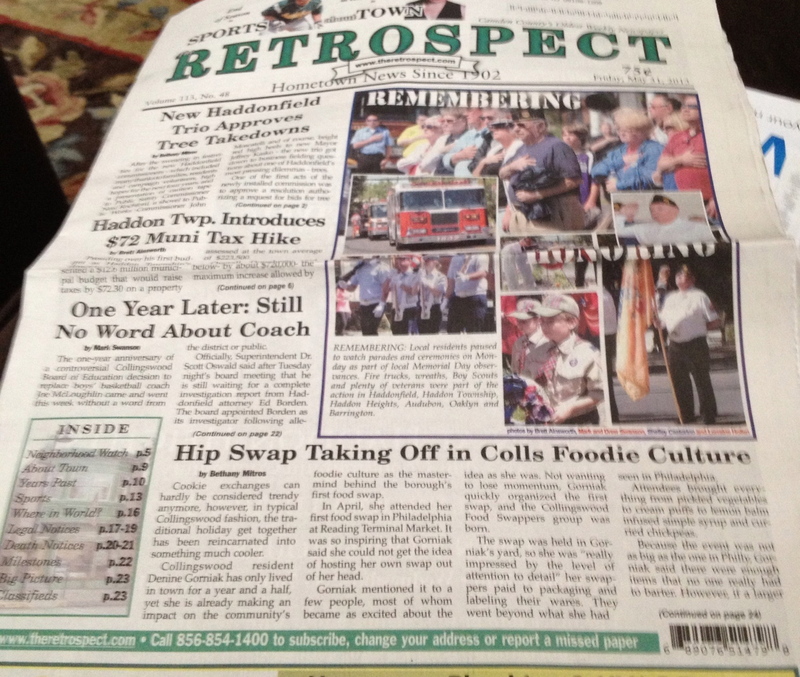 In less than 2 week's time, I went from having hosted my first food swap, to having our local newspaper, The Retrospect, contact me for an interview about our event, to having a full-on private "club" dedicated to food swapping in Collingswood! 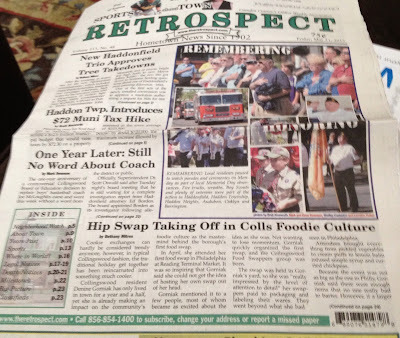 I have a new Facebook page, CollingswoodFoodSwappers, with over 125 followers, an awesome article in the local paper - front and back pages, and our 2nd swap scheduled for June 25th, t 6:30 pm at The American Table on Haddon Avenue in Collingswood. There are plans for future swap events, as well as other food and drink related events to take place in the Fall and Winter. In one week a lark of a hobby became a new venture for me! All this happened because I attended an event in April, at The Reading Terminal Market, for a food swap organized by Philly Swappers (A Philly Food Swapping Event!) I was so inspired by the event that I knew that I needed to do one of my own. In the spirit of "YES! YOU CAN DO THIS!" I decided to give it a shot. Even though so many other people and organizations are doing this, no one in my area is running a food swap. I realized that I could do my own thing, taking my cues from other events and making my event its own thing. It's a great feeling to DO instead of talking about it, or thinking about it, or feeling envious of others doing cool swaps or events. Interest and real excitement seems to be building for the group. Within moments of creating the Facebook page - Collingswood Food Swappers received over 40 likes. I had 2 emails from the article from people who were interested in joining the next swap. People have offered their venues to host the next event. Neighbors and friends have commented on reading the article or having seen the participants from the first event coming to our house! Today I received an lovely email from the President of Proud Neighbors of Collingswood, Marleen, congratulating me on the article. She said that in my short time living here (in Collingswood) that "you have already made quite a contribution to our community. Thanks for your active role." Colour me excited! Our June Event, will be held at The American Table, a kitchen and home goods store at 740 A Haddon Avenue, Collingswood, NJ 08108. I teach cooking classes here from time to time. As a matter of fact, I had and will have several classes here in June. Last week I ran my Mexican-Inspired Menu class, modified from my catering event I did for Jay and Jodi Previn a few weeks ago. I'll be doing a Summer Salsa cooking demonstration at The Collingswood Farmers' Market on Saturday, June 15th, 9 to Noon. On June 18th, I'll be doing a Summer Menu Class - featuring my Garden Gazpacho, Grilled Tuna with Whitebean Spread Sandwiches, and Summer Berry Trifle. I like the space at The American Table - it's bright and airy, long and inviting inside. A perfect spot for teaching, doing demonstrations and hosting cocktail parties or other foodie related events. If you are interested in joining us for the June 25th Collingswood Food Swappers Event, please go to my EventBrite.com registration page. Space is limited to 30 participants. Click on this link here. Come out and enjoy The Collingswood Food Swappers Event at The American Table! Foodie culture hits Collingswood in a whole new way! Join your friends and neighbors while exploring new food horizons! A food swap is a modern hip twist on a cookie exchange, with better food and more fun! You bring your homemade or homegrown foodstuffs via a direct trade or barter system with others. i.e. your preserved lemons or jams for a pint salsa or a bag of veggies from your garden. It’s not just for Collingswood Residents! We welcome everyone, as long as you bring something you made, infused, or gardened yourself. You must pre-register to attend. If you plan to bring a family member or friend who will be swapping their own foods, please register them separately. Everyone who wants to trade foodstuffs must bring something along. Tuesday, June 25, 2013 6:30 pm to 8:30 pm. Please arrive promptly or a bit before 6:30 pm. Event will last about 2 hours. We will mingle, peruse and sample each others’ goods, then we’ll swap! Food to swap: All swap items must be homemade, homegrown, or infused by you. Think preserves, baked goods, fruits, vegetables, herbs, spices, condiments, beverages… you name it! Bring as little or as much as you like. You can bring a bunch of one thing or multiples of a few different things. The possibilities are endless! We recommend that you bring 10 to 12 of your items. Keep in mind that swappers will be examining and picking up your goods, so be sure to package them in a way that protects the food and makes it clear the amounts you want to swap. When applicable, it is recommended that you include storage and shelf life information. If possible, you should also bring samples for others to try, along with disposable spoons, forks, toothpicks, etc. Description: Label each of your items with the contents/name of the foodstuff. Please put your name on it as well. Date it, (made on) and use by Date. Special instructions - heat, refrigerate, stir, etc. GET CREATIVE! Packaging is an expression and extension of yourself and your brand (if applicable). If you have a blog or website, or business, share it! Recipes or How to Use - if you have a recipe to share, or ways to use your product, describe it and share it! • Release form: Please note that you will need to sign a release form in order to attend. Copy the release form below; Print it out; Sign, and bring it with you to the swap. I am aware of the risks of participation, which include, but are not limited to, acquiring hand crafted goods not necessarily prepared in licensed kitchens or factories. I understand that participation in this event is strictly voluntary, and I freely chose to participate. I, and my heirs, in consideration of my participation in the June 25, 2013, food swap, hereby release and hold harmless Collingswood Food Swappers, The American Table, and their founders and members, venues, and any other people officially connected with this event, from any and all liability for damage to or loss of personal property, sickness or injury from whatever source, legal entanglements, imprisonment, death, or loss of money, which might occur while participating in this event. In signing this release, I acknowledge and represent that I have read the foregoing Release of Liability and Hold Harmless Agreement. Follow and Like our Facebook Page - Collingswood Food Swappers. Find out more about the Collingswood Food Swappers and how it works check out these posts at TheBicycle-Chef.com. There are several posts relating to food swaps recently attended. The April Event - Held by the Philly Swappers (A Philly Food Swapping Event). Collingswood Food Swappers Event, held by Denine Gorniak in May - The 1st Collingswood Food Swap! This is a community event; however, participants must pre-register, which means this event is operated as a private club. • By participating in this event, you are acknowledging that the food items being shared are not necessarily prepared in commercial kitchens or spaces inspected by any government agency. • By participating in this event, you are also acknowledging that you will use the highest standards of safety and cleanliness in food preparation. • By participating in this event, you assume all liability; specifically, you agree to not hold liable food swap hosts, swap venue owners/providers, or other swap participants.